Catherine Perez oversaw development of the Note and Kicks before becoming the “control tower” for Nissan's new midterm plan. YOKOHAMA, Japan -- Nissan Motor hardly seems like an automaker in need of more corporate tie-ups, with its alliance links to Renault and Mitsubishi, and a network of partnerships with Daimler of Germany, AvtoVAZ in Russia and China's Dongfeng group. But Nissan is embarking on a global hunt to bring more high-tech startups into the fold. The executive leading the charge, Catherine Perez, a corporate vice president, readily admits she has no idea what kind of technology the search will unearth. But, she emphasizes, that's precisely the point. As the self-described "control tower" for Nissan's latest midterm plan, Perez says remaining flexible on opportunities and allowing for unknowns will be the keys to Nissan's success in the new era. That is a big reason Nissan jettisoned detailed numerical targets in the M.O.V.E. to 2022 business plan unveiled late last year by CEO Hiroto Saikawa. Perez said such milestones quickly become moot amid fast-paced change. As Nissan's top executive in charge of partnerships and business planning, Perez had a strong hand in crafting the midterm plan. She was promoted to the position in April 2017. "My role is kind of the control tower of the midterm plan," Perez, 52, said in an interview at Nissan's global headquarters here. "I think it was probably irrelevant to stay with sets of numbers that could be completely changed or irrelevant three or four years down the road." Perez has had a variety of assignments with the automaker. 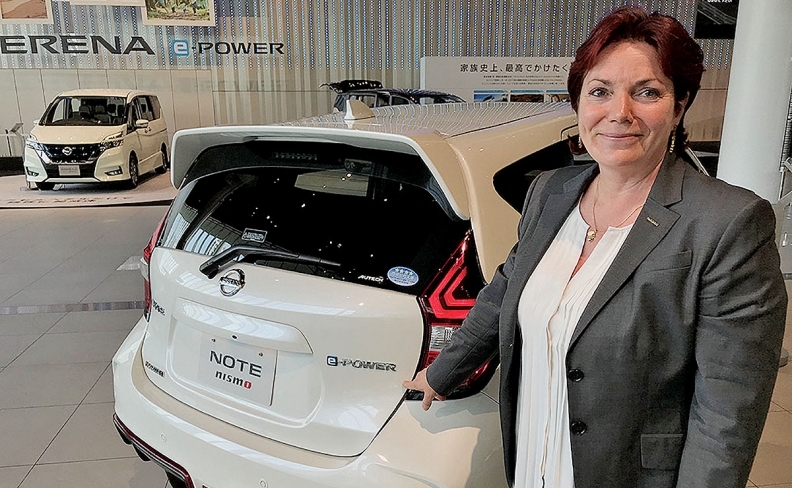 She was vice president of North American purchasing before moving to Japan to serve as program director of Nissan's B-segment vehicles, leading development of such nameplates as the Note subcompact and Kicks crossover. 1. The rapid clip of technological development means the product development cycle is speeding up dramatically. Work processes that once took half a year can now be done in days. 2. Competition is moving beyond the car to services sold on top of the hardware. 3. The traditional notion of car ownership is under siege as companies dabble with subscription programs, ride-hailing and car-sharing. Nissan's growth strategy focuses on heavy investment in three pillars — electrification, autonomous driving and connectivity. And Nissan is seeking help with all three, she said. "We need anything you have that would bring an edge to connectivity, to electrification, to autonomous driving," she said of her message to outside companies. "Partnership has the advantage that you link with someone who has the capability." Nissan was already scouring Silicon Valley for startup help through its r&d center there. But the quest intensified in February when it hired search firm Plug and Play to scoop up startups in Japan. Plug and Play is expected to deliver a short list of possible partners this year. Japan's startup world is smaller than those of Silicon Valley or Israel. But it is still largely untapped and off the radar of international rivals, Perez said, making for some prime pickings. "Japan has talent," Perez said. "Size doesn't mean much anymore." Nissan is hardly alone in scouting the latest, greatest gems in the rough. Competitors in Japan and overseas are likewise busy teaming with consultancies to find them. But Perez said Nissan has extended reach through its web of corporate partners. "We are also using the leverage of the alliance, so where there are areas where we don't have visibility, one of the partners will," she said. "It's like an animal with multiple eyes." What new solutions will come from that vantage point? Not even Perez is sure. "I don't know what they'll come up with," she said. "It's normal that you haven't heard much about them yet. If you have not heard about them, it's because they are startups." Indeed, Nissan gave Plug and Play only the broadest of criteria and a mandate to be creative. "When you don't know what's going to pop up, you can't start out by saying I want only a red flower," she said. "You say, 'I'd like some flowers,' and we'll see what happens."